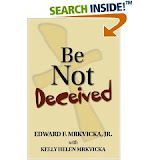 Edward F. Mrkvicka’s book, “Be Not Deceived,” offers Christians a comprehensive guide to discovering the messages and directives as written in the Bible. Mrkvicka provides a literal understanding of the Bible to help Christians understand the Word of God. The author explains that Christians have drifted away from the messages of the Bible to create a God that fits their lifestyle. The belief “Once- Saved-Always-Saved” is an important topic discussed throughout the book. Mrkvicka explains that abandoning the Word of God to justify current social behaviors will not lead to eternal salvation. Issues frequently discussed include abortion, homosexuality, and adultery. One of the most important points the author makes and discusses is that Eternal salvation is not a right, but a righteous gift. The author explains that we now live in a society where people expect rewards without sacrifice. This view has led many Christians to adopt the false belief that we are automatically saved as long as we believe and, therefore, repentance is not necessary. Obeying the Word of God is a key message throughout the book. The author explains that Christians must go back to the word of God as written in the Bible to achieve eternal salvation and avoid Hell. Mrkvicka provides a Spiritual Guide to the many problems confronting Christians today. The author emphasizes that every problem has a biblical solution. In each category, biblical quotes provide an explanation of God’s directive. Through this spiritual guide, the author shows that God gives direction for every problem facing Christians. The book, Be Not Deceived, offers Christians a guide to truly accepting the gift of eternal salvation. As the author points out, many Churches have abandoned the literal teachings of the Bible in an effort to accommodate societies changing beliefs on many social issues. Be Not Deceived gives Christians biblical guidance when tackling the many social and spiritual issues confronting society today.